Lumpy uneven filler can be fixed with a simple injection of Hyaluronidase (Hyalase) at JUVERNE with Dr Sonam Yadav. We have expertise in injectables and the use of Hyaluronidase to dissolve and correct problem areas / incorrect filler injections. Hyaluronidase is the enzyme which is naturally present in your body and digests the sugar Hyaluronic Acid (HA). Dermal fillers such as Juvederm, Restylane, Yvoire and Belotero and a number of other brands are available today; all of these are HA based fillers. Which means they have concentrated synthetic gels of HA which when injected into the face/body improves hollows, lines, features and skin quality. Hyaluronidase is available in a synthentic concentrate for injection by doctors. Dermal fillers if not done correctly or at the right spot can become lumpy, uneven and unsightly. These can be dissolved with hyaluronidase and correct treatment done with a doctor with hyaluronic acid fillers. Some swelling is normal post dermal fillers which are correctly done. Wait a month and see your injector for assssment before thinking of dissolving anything. If you have any emergency needs/symptoms post filler though, go immediately to them. Any blockage and blanching caused by filler complications is very serious & needs immediate management by the doctor. Any person who is not allergic to hyaluronidase and bee venom can have this done. However treat this as an emergency method not a routine use (much like an i-Pill vs daily birth control) since serious allergies can eventually develop. Risks of anaphylaxis do remain though it is rare. It is also non specific and dissolves natural as well as injected Hyaluronic acid. Thus conservative use is recommended. Discuss with your doctor. 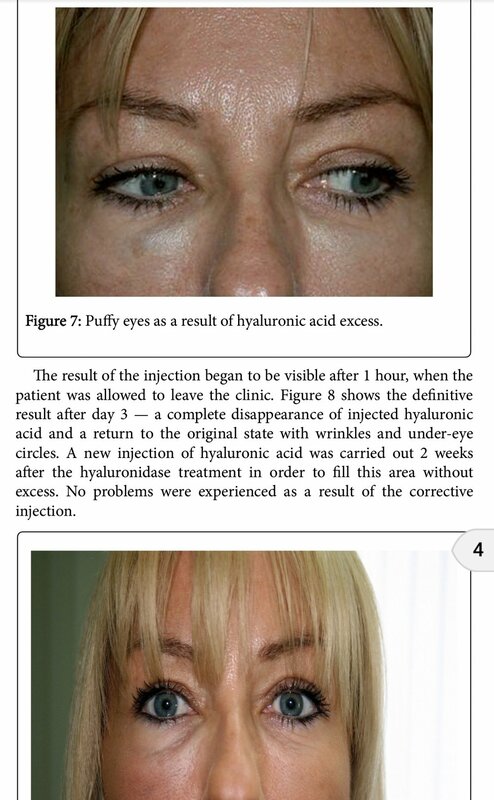 The use of hyaluronidase is well established to correct problematic dermal fillers. 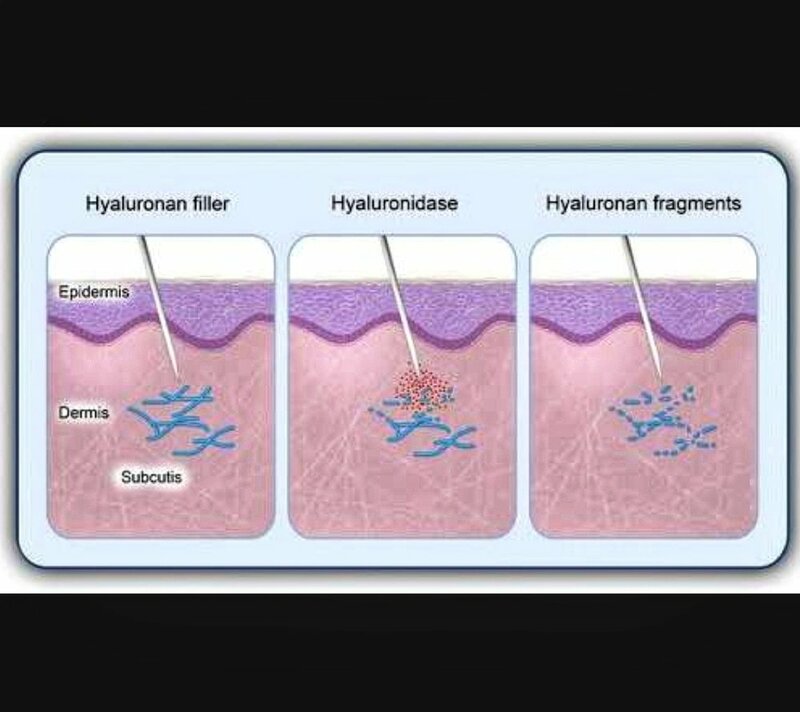 Very low doses of hyaluronidase can remove hyaluronic acid filler nodules, but more rapid resolution is seen with slightly higher doses, according to a study published online April 25 2018 in JAMA Dermatology. 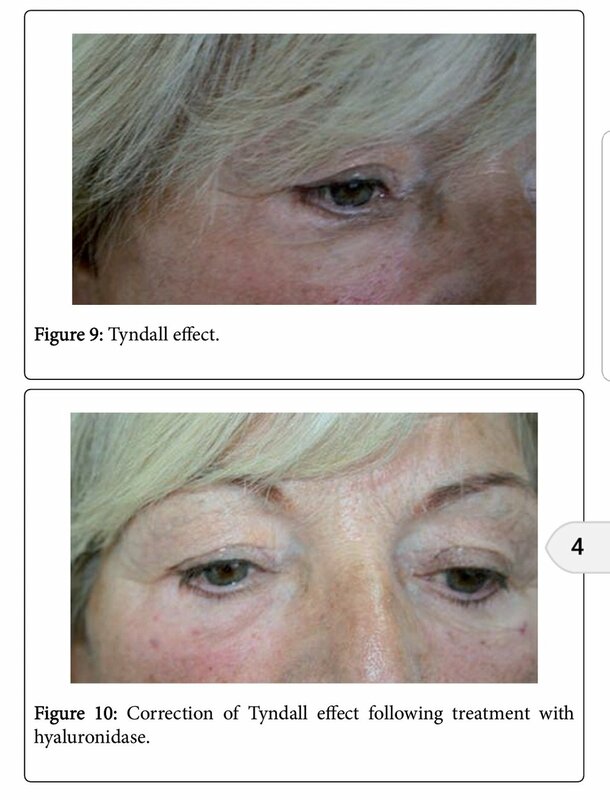 Lumpy Incorrectly Done Filler Under The Eyes Can Cause A Bluish Lump (Tyndall Effect) which is corrected with Hyaluronidase / Hyalase.